In 1977, Stephen Kress used a creative approach to reintroduce Atlantic Puffins to Eastern Egg Rock, an island in Maine’s Muscongus Bay: decoys! It had been 100 years since these charismatic birds had inhabited the island. Today, thanks to the continuing work by Dr. Kress and Project Puffin, the island is home to more than 100 nesting pairs of Atlantic Puffins. They had been gone from the island for a hundred years. 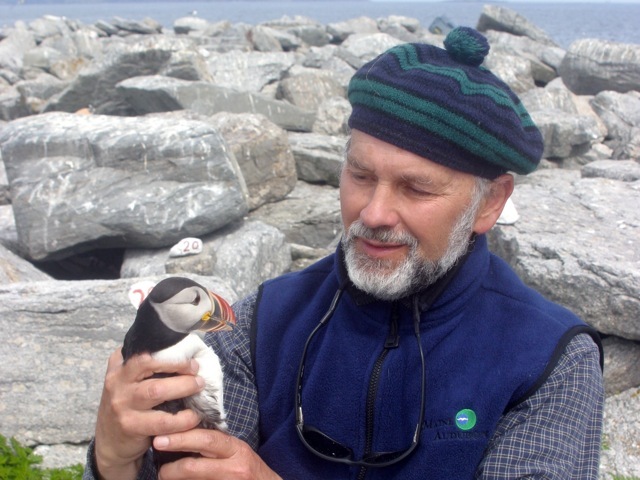 But in 1973 Dr. Stephen Kress reintroduced six Atlantic Puffin chicks to Eastern Egg Rock, an island in Maine’s Muscongus Bay. He nurtured them by leaving fish in their underground burrows. A few weeks later, the birds fledged, departing at night for the open sea. Knowing puffins return to the spot where they fledge, he and his team waited. For four years, no puffins returned. There’s much more about Project Puffin’s groundbreaking work at BirdNote.org. Bird sounds provided by The Macaulay Library of Natural Sounds at the Cornell Lab of Ornithology, Ithaca, New York. Call (groan) of Atlantic Puffin adult with piping of young  recorded in nest burrow by W.W.H. Gunn. Wave action feature is Nature Essentials SFX #21 recorded by Gordon Hempton of QuietPlanet.com. Ambient waves recorded by C. Peterson at Hog Island, Maine. Read more in The Christian Science Monitor!